Reflections on George H.W. Bush | A.B.E. Remodeling, INC.
We just wanted to take this time to reflect on the life and death of president George H.W. Bush. Below is the announcement made by current president Donald Trump. We share in the national recognition of this loss and honor his life. We trust you will find this interesting. Thank you.
" 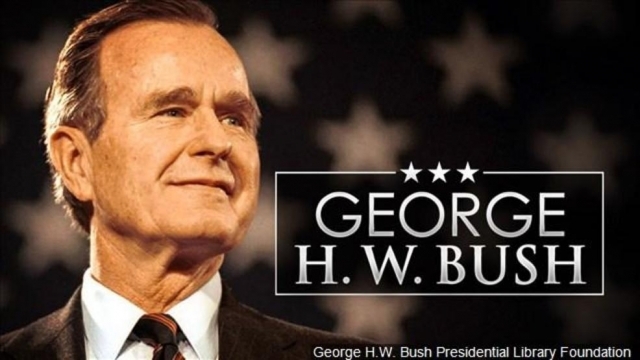 TO THE PEOPLE OF THE UNITED STATES: "
President Bush led a great American life, one that combined and personified two of our Nation's greatest virtues: an entrepreneurial spirit and a commitment to public service. Our country will greatly miss his inspiring example. On the day he turned 18, 6 months after the attack on Pearl Harbor, George H.W. Bush volunteered for combat duty in the Second World War. The youngest aviator in United States naval history at the time, he flew 58 combat missions, including one in which, after taking enemy fire, he parachuted from his burning plane into the Pacific Ocean. After the war, he returned home and started a business. In his words, "the big thing" he learned from this endeavor was "the satisfaction of creating jobs." Even with all he accomplished in service to our Nation, President Bush remained humble. He never believed that government -- even when under his own leadership -- could be the source of our Nation's strength or its greatness. America, he rightly told us, is illuminated by "a thousand points of light," "ethnic, religious, social, business, labor union, neighborhood, regional and other organizations, all of them varied, voluntary and unique" in which Americans serve Americans to build and maintain the greatest Nation on the face of the Earth. President Bush recognized that these communities of people are the true source of America's strength and vitality. It is with great sadness that we mark the passing of one of America's greatest points of light, the death of President George H.W. Bush.